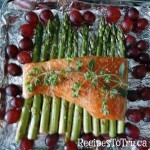 Place asparagus in single layer on a foil covered baking pan (saves time on cleaning). Sprinkle the oil, garlic and salt and pepper over the asparagus. Mix the honey and Dijon must together. 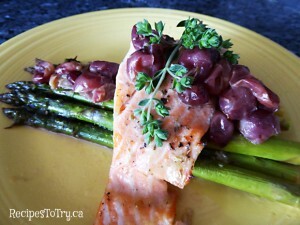 Surround the vegetables and salmon with the grapes. Put in the Cuisinart convection steam oven in the middle rack position and set the oven to Bake Steam at for 15 minutes.